After noting a slight blemish on my face (from too much sun exposure) I eventually opted for the Blanc de la Mer The Brightening Essence Intense, at first the marks seemed to fade away slowly - but then, seemingly overnight, it improved dramatically! I am really happy with the remarkable results! 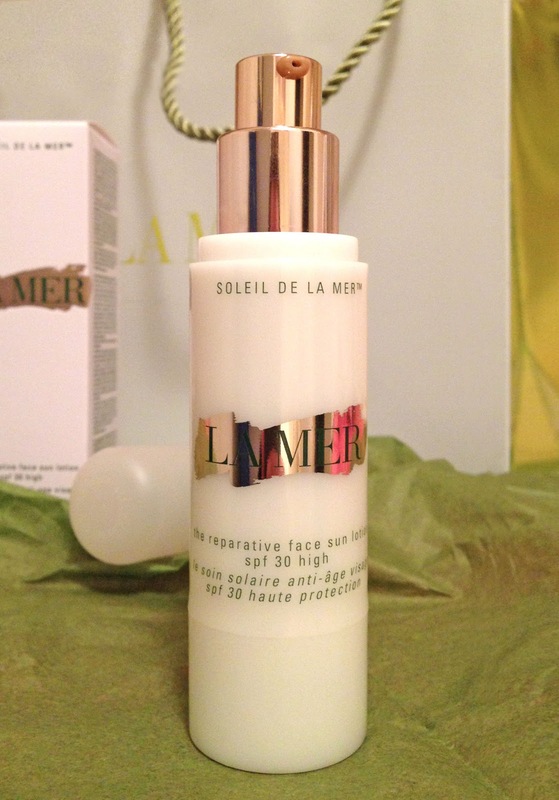 However, it doesn't matter which product one uses on one's skin (even fabulous La Mer) for brightening and toning spots, continued exposure to the sun will trigger the return of blemishes. UVA rays are constantly present, no matter the season or the weather. If you think you can't get sun damage on a cloudy day, tell that to the UVA rays. They are so powerful that they also penetrate some clothing and even glass. (When was the last time you applied sunscreen before getting behind the wheel? )UVA rays used to be considered relatively safe, in terms of the sun's rays, and that's why tanning beds, which use UVA rays, took center stage. But we now know that using tanning beds before the age of 30 can actually increase your risk of skin cancer by 75%!Also UVA rays are the rays responsible for the signs of aging because they are able to penetrate much deeper into the surface of the skin, damaging the cells beneath. When you think of UVA rays, think sun spots, leathery skin and wrinkles. UVB Rays are the rays you can blame when you get a sunburn. Unlike UVA rays, these rays aren't always the same strength year round - They're more prevalent in the summer months, however they are able to reflect off of water or snow, so it's always important to protect yourself year-round.UVB rays are responsible for causing most skin cancers. While large doses of UVA rays can contribute to cancer, it's the UVB rays that are commonly to blame. When you think of UVB rays, think sun burn and cancer." I love the bottle, evolved from The Moisturizing Lotion and The Oil Absorbing Lotion design, it has a lighter slightly pink cap with a sparkly base and a copper colored top. One item various users says to me is that the smell resembles traditional SPFs more than the iconic La Mer scents, which has been a deterrent for some. I have to agree, but only slightly, it does have a unique smell which does slightly resemble the white sandy beach aroma of sun block. Shop The Reparative Face Sun Lotion Broad Spectrum SPF 30.